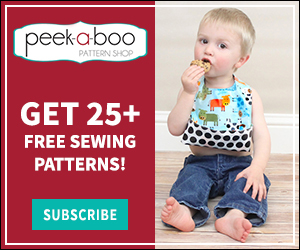 Snap Crotch Swimsuit & Leotard Tutorial - Peek-a-Boo Pages - Patterns, Fabric & More! 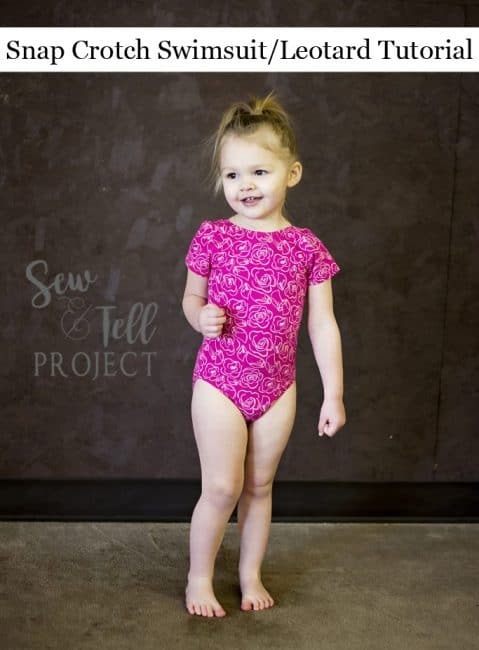 Alisha and Eleri from the Sew and Tell Project are sharing two methods to add a snap crotch to the Swan Lake Leotard and Swimsuit! Even though the leotard is designed to be easily pulled up and down through the neck hole, we thought that for the diapered set, snaps make for easier changes. Alisha (who is expecting her FIRST baby girl after four little men) is sharing how she did a onesie style snap bottom dress for her little girl. Alisha made her skirted leotard using Riley Blake Vintage Floral and red cotton lycra both available at Peek-a-Boo Fabric Shop. 1. First, you will need to cut your pattern pieces out as called for in the instructions. Make sure you have some extra fabric to create your binding for the leg openings as well as two scraps of interfacing (approximately 1″ by 3-4″). I am cutting out view C for my example. 2. Trim 1/4″ off both the front and back lower bottom pieces where you would sew them together. 3. Round the corners in the crotch. I used a spool of thread to trace around. You can see my blue lines here where I will trim them. 4. Next stitch the bottom front and back together at the side seams. After you have stitched them together, measure the length of the opening. I started at one side seam, went around the back to the other side seam, and around the front to the beginning. Then you’ll need to do a bit of math to determine how long to cut your binding. Multiply the length you got times .75. Mine measure 26.5 inches. 26.5 times .75 equals 19.75. I then added one inch of seam allowance for a total binding measurement of 20.75. I cut my binding 1.75″ by 20.75″ making sure the stretch went along the length of the binding. 5. After cutting out my binding and sewing the two short ends together with a 1/2″ seam allowance, I pressed it with wrong sides together. Then I clipped it along the bottom of the onesie. This may take a bit of fiddling because the back opening is slightly longer than the front. 6. Next I opened up the binding at the front and back crotch and ironed on my pieces of interfacing. I made them the length of the front and back crotch. The interfacing provides reinforcement for the snaps. 7. After applying interfacing, I clipped my binding back on making sure the interfacing lined up with the front and back crotch. 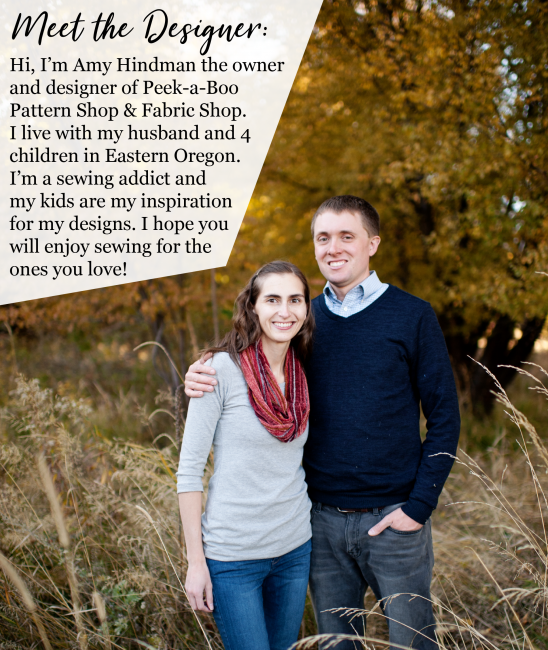 I used a stretch stitch and a 1/4″ seam allowance to stitch it on. 8. I then pressed the binding down and topstitched the seam allowance to the opening. After topstitching, I installed snaps along the crotch opening on the front and back. Make sure to overlap your front and back in the correct direction while installing the snaps. 9. Finally, complete construction of your leotard as directed. Now Eleri will share how to add snaps using a band and facing at the crotch to allow you to still have elasticized legs. For this part of the tutorial, I am sharing a short sleeved option with no skirt made with this beautiful Art Gallery Fusions cotton lycra. We are going to attach a band and a facing in this method. The facing will go on your front pattern piecing, and the band will go on your back leotard piece. Gather all your pattern pieces. We will make one simple alteration to either the front pattern piece (or the bottom front piece if doing the skirted view). We are going to remove 1/2″ from our front piece. (Note: the front piece is gently flared – You can either adjust the flare gradually back to the original width now, or leave alone. If you don’t add the width, you will need to make a slight adjustment toward the end). Cut out your pattern using the adjusted front piece, and the non-adjusted pieces. Take your front leotard piece. Measure the width of the crotch. We are going to take that width + 1″ to cut a small 1″ wide strip for our facing. If you adjusted to keep the original width of your crotch – you will make a shaped facing instead). Place a narrow strip of interfacing across the long edge of your facing. My interfacing is approximately 3/4″ of an inch wide. If you are adding snaps to a swimsuit, you might not be able to use iron on interfacing. I recommend using sewn in interfacing or a couple layers of swim lining instead to reinforce areas where your snaps will go. . Your back piece will look like this after it has been cut out. If you follow the non-snap tutorial of the pattern, this “flap” or tab disappears into the seam allowance. We will eventually sew our band to tab and it will disappear into our 1/2″ seam allowance. 3. Sew the front crotch and the facing right sides together using 1/2″ seam allowance. 4. Trim away your seam allowance to roughly 1/4″ using sharp scissors. I like these Fiskars razor edge scissors to clip my threads and corners. This picture shows the “finished edge” on the left leg opening. The right leg opening still needs to be flipped and stitched toward the wrong side. 5. Next assemble the rest of our suit so we can attach the elasticized leg. Attach the elastic from the seam where we have attached our facing gently stretching until you reach the seam allowance tab (pictured in step 2) on the back leotard piece. Stop before reaching the tab. Remember that most of the stretch should be in “bottom coverage” area of the leotard. 6. After you attach your elastic, you will flip the elastic toward the wrong side of the leotard (see above picture) and sew flat against the leotard. (I stitch right along the edge). When you reach the end of your elastic, you continue to roll the edge of the non-elasticized fabric toward the facing. This will “finish” the edge of our facing. Repeat on the other side. Next, fold your facing edge toward the wrong side of the front crotch piece. Stitch down using a stretch stitch. Excuse the choppy stitching – my machine became angry at the elastic toward the end of the tutorial. 7. Now measure the tab of your back leotard piece. Because this will be going on as a band and NOT facing we will make our band piece 2″ by the width of the tab + 1″ for seam allowance. We will now fold our band piece in half along the long edge and stitch on both edges using 1/2″ seam allowance. Trim away the excess. Turn right side out and press well. 8. Now we sew the band to the back crotch piece, right sides together (not pictured). I then pressed and topstitched my seam allowance toward the wrong side of the leotard. Please note, I am stitching my seam allowance down – NOT flipping this band up to stitch. 9. Remember in step 1 how I said you could adjust the piece back to the original width after removing the 1/2″ length? Because I did NOT do that, my bottom band ended up slightly wider than my top crotch with facing. To remedy this, I gently folded each corner (and this was conveniently covered by my snap placement) but in the future, I will take the time to adjust the crotch piece back to the correct width. As mentioned in the beginning of the tutorial if you do a SHAPED facing on the original crotch width, your finished crotch piece will be the correct width. 10. Add your snaps. I added 3 even though two would have been fine. Now, go dance!